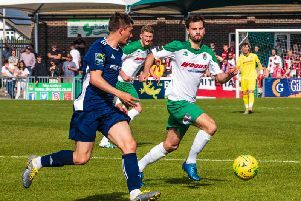 A double from Dan Smith and another goal for Brad Lethbridge - all in the second half - helped Bognor continued their unbeaten start to the season. The Rocks kicked off looking to make it two home wins in four days, but it was the visitors who started the brighter as they found success with Chris Gregan’s long throw - but Stortford were unable to find a way past Dan Lincoln in the home goal. As the first half progressed both teams struggled to take a firm grip of proceedings although Lincoln did have a save to make from close range when Chinedu Osadebe found space to get a shot off. There was a setback for Bognor midway through the half when Tommy Block was forced off through injury and had to be replaced by Tommy Scutt. As the half drew to a close the away side had a real chance to score when they were given a free kick on the edge of the home penalty area - however the resulting free kick flew high over the bar into the Sussex sky. As the teams returned to the pitch it was clear the words of the managers were still ringing in the players' ears. A neat shot by Smith was saved superbly by Callum Kitscha with the resulting corner cleared easily. Twenty minutes were left when it suddenly burst into life. Jimmy Muitt received the ball on the right and his cross was met by Lethbridge, who tapped in from close range much to the delight of the Nyewood Lane faithful. The visitors tried to force an equaliser; however it was Bognor who scored again four minutes later as Doug Tuck had a shot on the edge of the box, only to miscue it - but Smith was the lucky recipient as he turned and smashed the ball low and hard past KItscha who was left grasping at thin air. The Rocks made sure of the win eight minutes from time as Archie Edwards was brought down inside the penalty area by Stortford debutant Isaac Nkosi. Smith stepped up to take the resulting kick and he made no mistake from 12 yards,completing a very good result for the Rocks. Jack Pearce and Robbie Blake will be delighted to see their side in second place in the Bostik premier after three games. They go to AFC Hornchurch next Saturday. Rocks: Lincoln, Davies, Edwards, Tuck, Field, Wood, Whyte, Block, Smith, Muitt, Lethbridge. Subs: Sparks, Ridge, Scutt, Heath, Walsh. * Report by Lee Roberts - the voice of Rocks Radio - listen to every game live on Rocks Radio. See Twitter and Facebook for links.